7 - How to set up the predicate to always perform an Union ? The term Fragmentation is more an OBIEE term whereas the term partitioning refer more to the database side. Depending of a value of column, you can split the query against a table or an other. Very often, the table are fragmented according to the most important dimension in a star schema the time dimension. All request for the current year will be then performed against the current year table and the database will not need to retrieve all the data (The history data are exlcuded). to increase at the end the performance. The BI Server decide to use one logical table source rather than a union of relevant fragment source when you have include in the filter a predicate on the fragmentation column. The filter is evaluated against the fragmentation content definitions to decide which of the sources will be use for the query. If a logical table is sourced from a set of fragments, it is not required that every individual fragment maps the same set of columns. However, the server returns different answers depending on how columns are mapped. If all the fragments of a logical table map the same set of columns, than the set of fragmented sources is considered to be the whole universe of logical table sources for the logical table. This means that measure aggregations can be calculated based on the set of fragments. 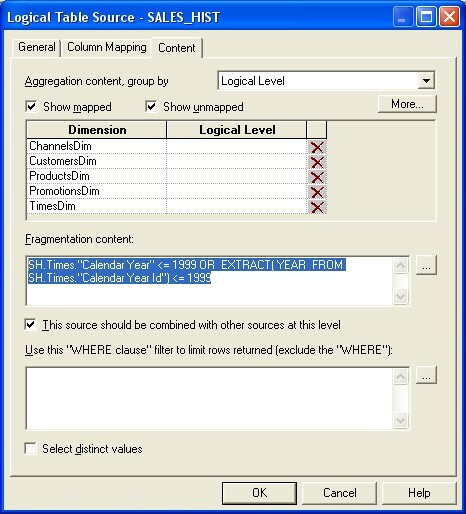 If the set of mapped columns differ across the fragments, than the Oracle BI Server assumes that it does not have the whole universe of fragments, and therefore it would be incorrect to calculate aggregate rollups (since some fragments are missing). In this case, the server returns NULL as measure aggregates. A domain can have many sources. The sources have to all follow the rule that each level must contain sources that, when combined, comprise the whole domain of values at that level. asking for Coke, Pepsi, and 7-Up do not leave out 7-Up. requesting information that has been precomputed and stored in aggregate tables can retrieve that information from the aggregate tables, even if the query requests other information that is not stored in the aggregate tables. For instance, the below fragment is bad because it has a level on Month but fragment by day. The result is that OBIEE will not find him even if you had only a month attribute because the day attribute is not present. General rules, Overlap is permissible when there are parallel tracks (ie the use of an OR operator). The rule is that at least one of the tracks has to be nonoverlapping. The other tracks can have overlap. It doesn't expect an <>. The predicate below will not work. For each fragment, the upper value must be expressed as <. You will get an error if you use ⇐. Likewise, you cannot use the BETWEEN predicate to describe fragment range content. If you want to use a repository variable to define the predicate of each fragment, you have to set one repository variable by expression. An arbitrary number of predicates on different columns can be included in each content filter. Each column predicate can be value-based or range-based. The time-based content fragementation is based on the parallel content OR technique. 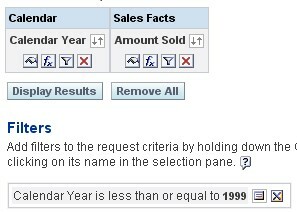 It supports the fact that a constraint on year must be sufficient to select a historical table define with a date snapshot. This example assumes that the snapshot month was April 1, 12:00 a.m. in the year 1999. In an order entry application, time-based fragmentation between historical and current fragments is typically insufficient. For example, records might still be volatile, even though they are historical records entered into the database before the snapshot date. Oracle talks of an unbalanced parallel Content. Assume, in the following example, that open orders can be directly updated by the application until the order is shipped or canceled. After the order has shipped, however, the only change that can be made to the order is to type a separate compensating return order transaction. The overlapping Year and Month descriptions in the two fragments do not cause a problem, as overlap is permissible when there are parallel tracks (ie the use of an OR operator). The rule is that at least one of the tracks has to be nonoverlapping. The other tracks can have overlap. This example is made with the sh sample schema. We will implement a simple value-based fragmentation between a history and an actual table. and the table SALES_HIST as the history table. 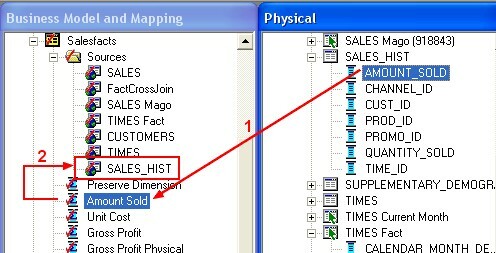 Then as the SALES_HIST is a copy of the SALES table and that we want that the two tables have the same behaviour we must create the same model for the table SALES_HIST than for the table SALES. The next step is to have for one logical column of the fact table, two physical columns. 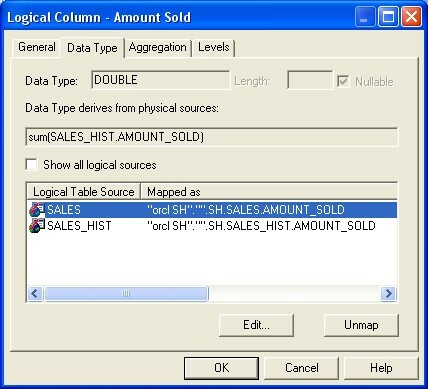 In this way, when you will ask for instance for the amount sold, it will retrieve the data in the two physical table (defined as logical table source) if the predicate is validated. Remark that by doing this, a logical table source SALES_HIST is created below the logical fact. Perform this step for all other physical measure columns (if needed). The next step is to set the fragmentation predicate to give all the information that need OBIEE to choose the relevant table. The OBI Server will fired this query that you can found in the log. You can then see in the log that OBIEE perform well the fragmentation and fired a SQL against only the History table. The fragmentation doesn't occur any more. You have to implement a time-based predicate (ie a parallel content predicate with the use of the OR operator). 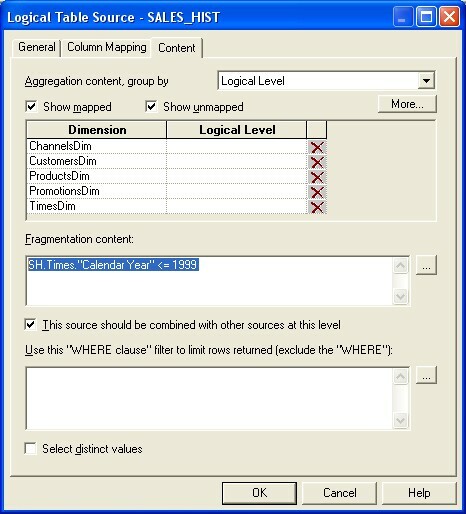 [nQSError: 15001] Could not load navigation space for subject area SH. two conditions: (1) GreaterThan(0), and (2) GreaterThan(1). Query Processing (What happens when you issue an Logical SQL Request (through Answers for instance) ? Cast as date - Which date format to use ? What means "Data is dense" ? How to create a dummy table ? How to retrieve data from BI Server in Excel ? How to model a bridge table (Many-to-Many relationship) with the joins property of a Logical Table ? How to find the value, the data type of a Server variable ? 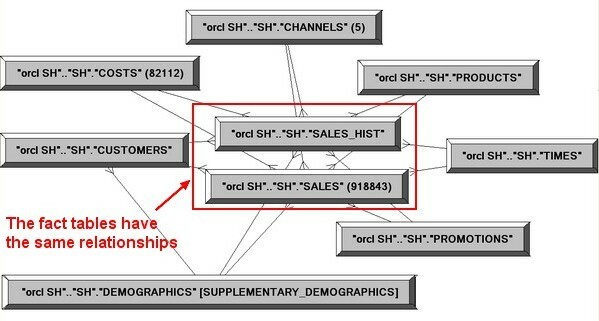 How to define OBIEE to leverage SQL OLAP Query ? How to define a Many-to-Many relationship with a Bridge table ? Why I have by default "No Privilege" on all object ? Regular Expression (Regexp) and how to filter on string pattern ? How to model the different relationships ? How to set and use a server variable (system/repository) of type date ? Where can I use a BI Server variable (session/repository) ? How to set a server variable with the session type via a dashboard prompt (with a request variable) ? How and where can I set a Request variable (SET VARIABLE) ? How to define one different database credential for each user (the shared logon) ? 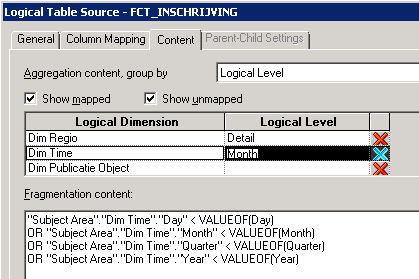 How to set up the time dimension (for time series functions Ago, Todate, ...) ? Which Usage Tracking time measure should be used to gauge the performance of SQL retrieval time ? How to control the use of the WITH CLAUSE and of STITCH Join ?